Crocidolite (Blue Asbestos), typically found in sprayed coatings, pipe insulation and cement based products was banned in 1985. Amosite (Brown Asbestos), is usually found in asbestos insulating board (AIB) and was banned in 1985. Chrysotile (White Asbestos), was legal until 1999 and banned thereafter. Often found in cement based products, artex and floor tiles, Chrysotile can be found in insulation materials and insulating board (AIB). Generally containing 10-15% asbestos fibres which are bound in portland cement or calcium silicate. Uncoated sheets, widely used in the past as a building material can be identified as light grey in colour. Whilst they were banned in 1999, asbestos cement products are the most common application of asbestos. Many houses, especially if built between the 1940s and the mid 1970’s will have asbestos cement garages and other asbestos cement products within and around the house. Often used for: Construction material, Corrugated roof sheets, Wall cladding, Roof tiles, Soffits, Guttering & down pipes, Soil & vent pipes, Verge plates, Flues, Bath panels, Panels to airing cupboards, around gas & electric meters. This is a compressed board that contains asbestos fibre and Portland cement or calcium silicate with other materials. Often used for: Fire protection, thermal and acoustic insulation, resistance to moisture movement and general building board. Millboards manufactured between 1896 and 1965 can contain chrysotile asbestos (up to 97%). Often found in: Pipe runs, electrical gear, vaults, storage. Often used for: General heat insulation and fire protection. Also used for insulation of electrical equipment and plant. Are contained within products that can generate very high fibre levels if disturbed. Often used for: Fire protection on structural supports (eg columns and beams), fireproofing and soundproofing. Vinyl, thermoplastic tiles and bitumen can contain asbestos. Floor screed typically contains about 2% asbestos. These screeds were often used in areas of high occupancy such as stairwells and entrance halls. Where used for lagging or packing material ropes and yarns can contain 40 – 100% asbestos depending on its functional requirements. Often used for: Pipe lagging, insulation, jointing pipes, heat resisting situations. 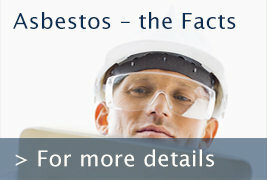 May contain asbestos and if well bonded and fibres are not often easily released. However, because of the asbestos content it to be worked with safely. If you require more details regarding the types of asbestos call us today on 0330 055 7294 or click here to fill in our quick contact form. 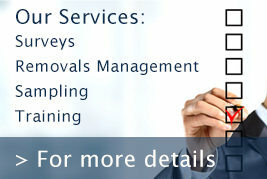 A member of our team will get in touch as soon as possible.